Our Sunny Blend grass seed is a blend of 27% Creeping Red Fescue, 27% VNS Perennial Ryegrass, 26% Annual Ryegrass and 20% VNS Kentucky Bluegrass and it thrives in open areas with few trees and full sun conditions. 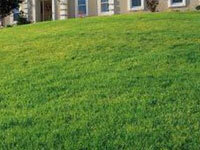 An elite grass seed mix blended specifically for bright to slightly shaded areas. Blended for quick growth, full coverage and it can take the heat. Available in 25lb bags. Our Shade Blend grass seed is a belnd of 50% Boreal Creeping Red Fescue, 20% VNS Perennial Ryegrass, 10% Park Kentucky Bluegrass, 10% 85/80 Kentucky Bluegrass and 10% VNS Chewings Fescue. 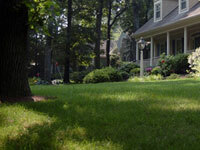 This blend is designed to help you grow a thick beautiful lawn in mostly shaded areas with minimal direct sunlight. 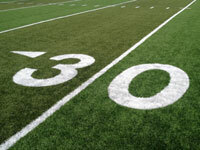 A tough, high quality turf grass. Available in 25lb bags. 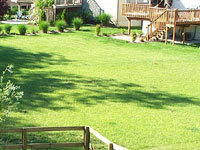 Our Sun & Shade Blend grass seed is a great all performance grass seed for industry professionals. This blend is comprised of 20% Kentucky Bluegrass, 20% Cache Kentucky Bluegrass, 20% Creeping Red Fescue, 15% Homerun Perennial Ryegrass, 15% Stellar Perennial Ryegrass, 10% Cadet Kentucky Bluegrass and is designed to be an all around durable performer in both sun and shade conditions. Available in 25lb bags. A traditionally hearty Athletic Mixture comprised of 20% Cadet Kentucky Bluegrass, 20% Arrowhead Kentucky Bluegrass, 20% Jewel Kentucky Bluegrass, 20% Homerun Perennial Ryegrass, 20% Apple II GL Perennial Ryegrass and designed to improve the playability of the field, withstand heavy use, recover quickly and stay green longer into the fall season. Available in 25lb bags. When it comes time to overseed an existing turf area we recommend either our Sunny blend or Athletic blend for high sun areas or our Sun & Shade blend for mixed condition areas for best results. 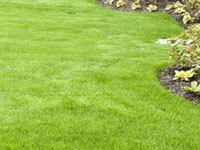 As with any of our grass seeds, we are here to help you make the right decision when it comes to a great looking lawn. All available in 25lb bags.